Boracay Island’s beautiful white beaches drew tourism that damaged the island’s ecology to the point that Philippine President Duterte shut down the island for a six-month cleanup. Tourism in the Philippines has burgeoned since 1990, when only a million tourists visited the nation. By 2017, the number had swelled to 6.6 million. While the tourist industry is an economic boon in some ways, it has come at a steep cost. Much as in the Caribbean, infrastructure hasn’t kept up with the rising number of visitors, and at many popular tourism sites, a high percentage of sewage has been discharged untreated or inadequately treated. The resulting ecological, public health, and aesthetic effects have in turn damaged the tourism industry that catalyzed the boom. Five hundred businesses that contributed to a $1 billion economy were affected, and livelihoods and lives were put on hold while the ecological restoration of Boracay began. With all the attendant growing pains, it was a dramatic signal that the Philippines had turned a corner and would comprehensively face its economic future head-on, starting with the fundamental necessity of clean water not just on Boracay, but throughout the nation. The groundwork for the island’s restoration had already been lain with a monitoring and regulatory program that has evolved over time. In 2004, the Philippine Clean Water Act (No. 9275) was put into effect, establishing water quality management as well as a mandate for the development of wastewater reuse standards for irrigation and fertilizer production. In 2015, with tourism growing, the Department of Environment and Natural Resources Environmental Management Bureau’s (DENR EMB’s) Beach Ecowatch Program determined that of the 75 beaches popular among both locals and tourists, only 21 complied with the DENR Standards, with 51 failing and three put under further investigation. The DENR soon established new water and effluent quality standards with 2016’s Administrative Order DAO 2016-08. It’s ironic that coastal communities worldwide are facing water shortages. With the fifth longest coastline of any nation — 36,000 miles — the Republic of the Philippines is running out of drinking water. Two types of water technology stand out as keys to preventing new damage to Philippine waterways, remediating existing water damage, and proving potable water for residents and visitors: wastewater treatment and desalination. Wastewater treatment not only prevents fouling of surface water, which has had devastating effects on public health, but it also allows islands to make the most of what fresh water is available through reuse for nonpotable applications such as toilet flushing, and agricultural and landscaping irrigation. Moreover, good sanitation is a must for resorts into order to keep tourist attractions attractive. Desalination converts seawater to drinking water. It was for many years cost-prohibitive, but due to technological advances, the price is now within reach of a much broader market. Only about 10% of sewage in the Philippines is treated. This could be because islands are ill-suited to centralized water and wastewater treatment, which has been the standard for decades. But islands are ideal for decentralized treatment, which brings treatment to where it’s needed, eliminating costly piping infrastructure. And, because of their compact size, decentralized treatment plants can be situated in a way that preserves the ambience of tourist areas. Fluence has revolutionized decentralized treatment with its Smart Packaged wastewater treatment and desalination plants, which are efficient, scalable, and affordable. The plants are provided in standard shipping containers that are optimized to resist the elements. They’re portable, require a small footprint, and are quickly commissioned. NIROBOX™ is Fluence’s Smart Packaged desalination solution. Units of several capacities are available. A single, 40-foot container can produce up to 1,500 m3/d (275 GPM) of permeate water, making it one of the most compact plants available. Units can be used in tandem to increase capacity. For wastewater treatment, Fluence offers revolutionary Aspiral™ units, which use membrane aerated biofilm reactor (MABR) technology to slash energy costs while providing effluent quality high enough for reuse in irrigation or for release into the environment. Fluence’s MABR uses a spirally wound, air-permeable membrane that operates at near-atmospheric pressure to slash energy costs, low enough for use with alternative power sources. And simultaneous nitrification-denitrification not only produces high effluent quality, but it takes place in one tank for a small footprint. After a six-month cleanup, the popular beach areas of Boracay are now back open for business. 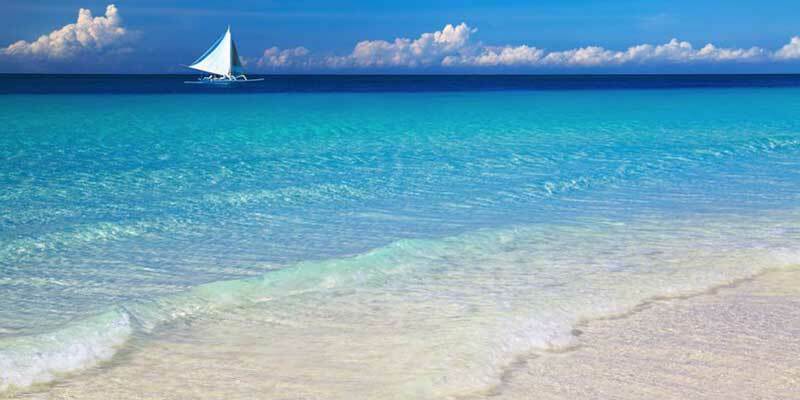 The commitment to preserving the worldwide popularity of unspoiled Philippine beaches continues, and the technology is there to help achieve the goal.